“I’M HAVING AN EMERGENCY!” I screamed as I burst into the bedroom jarring my peacefully sleeping husband awake. He’s been going through some pretty brutal chemotherapy and had suffered from a headache earlier in the day. He began trying to shake himself from the grips of the oxycodone to be present for me. “We need to call the Fire Department, or 911 or the Water Department! WHO DO I CALL?” I blurted out not giving him the space he needed to disentangle himself from the narcotics. He shot up in bed “WHAT? WHAT HAPPENED? !” he exclaimed. 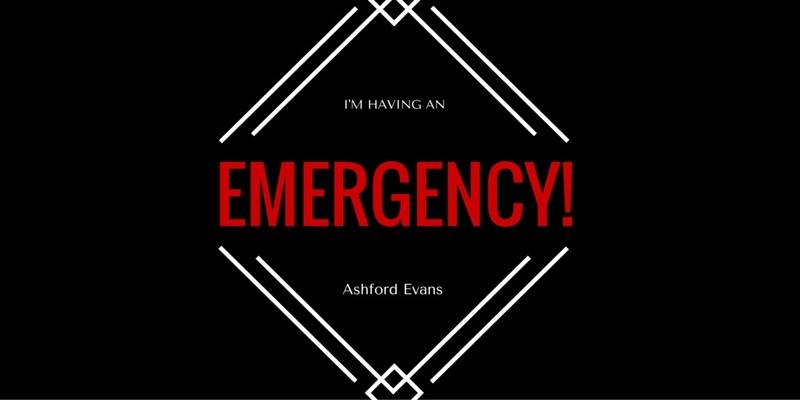 And as I began to recount the story it dawned on me that maybe, just maybe this wasn’t a terror alert red level emergency. You see I’ve lost the ability to regulate my emotions. Everything. And yes I mean EVERYTHING in my world has become a Defcon 4 level alert. I go from 0 to 120 in a matter of seconds at this point. It reminds me of a manager I had a few years back who would send no less than 876 emails per day. Finally our team met and we decided we needed to put her on a sliding scale to allow us to filter pertinent information because the overload was just too too much. We sat her down and explained to her that in the subject line of every email she must now use a $ sign. Five $$$$$$ meant that this information would greatly impact our paychecks whereas 1 $ meant it was important information but probably wouldn’t effect our bottom line as sales reps. She accepted our input and graciously agreed to our terms. She implemented our system the very next day. And each email that came contained the requested dollar signs. However, each one bore 5 $$$$$ in the subject line. After a few days we realized it was a lost cause. This is where I found myself as I recounted the “horrifying” details of the event. I was sweeping the front porch on the phone with my sister when I heard the dogs antagonizing each other only a few yards from me. Then I heard a strange yelp followed by silence as the larger dog (45 lbs) casually sauntered away. I quickly realized the smaller dog (4 lbs) was nowhere to be seen. I ran toward the spot where they had been tussling- no little dog in sight. I began screaming her name and heard a slight rustling sound coming from the depths of the storm drain in the street. This was when I knew exactly what had happened. “Call 911!!! !” she screamed as I hung up on her. I desperately pulled at the manhole cover which seemed to be hermetically sealed. I quickly ran to the back yard where the drain emptied into a ditch and screamed for the dog. My voice echoed down the long dark tunnel. 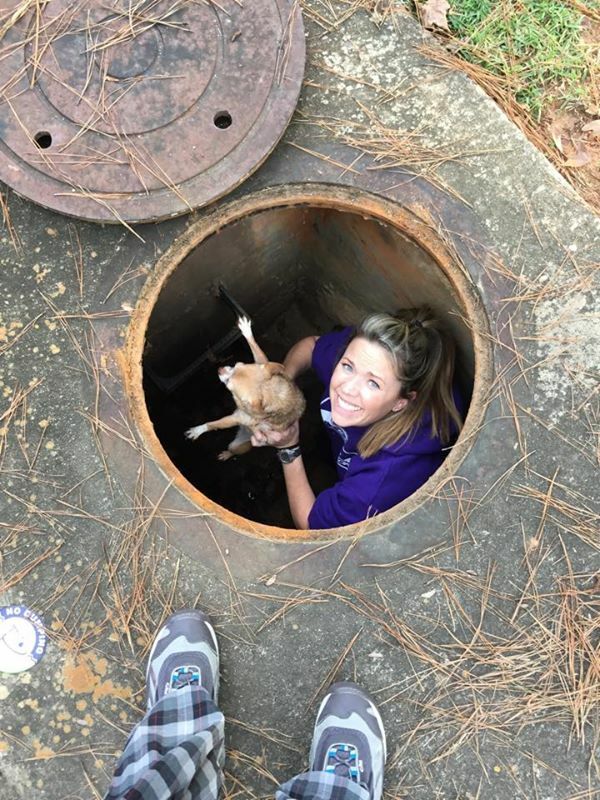 I quickly realized there was 5 inches of standing water throughout the length of the tunnel and my tiny tiny dog is only about that tall. There was no way she could navigate the passage. This was the point I decided we were in a state of emergency and needed to call for reinforcements. And thus I burst into the bedroom screaming an alarmist warning that my husband could only have interpreted as a credible threat to our safety and well being. I hurriedly tried to recount the events of the past few moments in a desperate plea. After he stopped laughing he calmly put his shoes on and followed me outside. He (with ease I might add) heaved the manhole cover away to reveal a dingy ladder into a wet, dark sewer. Let it be known we had just (the night before) watched a horror movie brimming with sewer passages, darkenss, and death. I took a deep breath and began my descent. Within moments I was ankle deep in the dirty water and began calling the dog. She was only a few feet away and ran to me- tail wagging the whole time. I picked her up, hoisted her out, and began climbing out myself. She was fine. I was fine. The world kept spinning and none were ever the wiser to the horrible near-tragedy that had befallen the Evans family. It wasn’t until a few moments later I realized the hilarity of the situation and covered in dirt, water, and dog hair found myself lying in the grass laughing. Sometimes the dire situations we find ourselves in aren’t quite so daunting. Sometimes they’re really just good stories. LOL you’re welcome girl!! You’re welcome. I love this I have a little dog named Lola too.